Prince Lucky wins the G2 Gulfstream Park Mile. Photo by Lauren King. Parx Racing announced its Horse of the Year, the region’s MATCH Series kickoff at Laurel Park is drawing near, and a plucky Pennsylvania-bred lit up social media over the past week. A six-year-old Street Sense gelding named Aztec Sense made headlines throughout social media during the week, when it was announced that he was named the 2018 Parx Racing Horse of the Year. Coming from humble beginnings, Aztec Sense was claimed by trainer Jorge Navarro back in 2017 for the modest price of $12,500. Since the claim, Aztec Sense has blossomed for Navarro and his owner, Joseph Besecker, going undefeated in 2018. Aztec Sense marched to victory eight times in 2018, with half of his victories taking place at Parx. The bay took down three stakes races at the Pennsylvania track along the way, including wins in the Turning for Home Handicap, the Salvatore M. Debunda PTHA President’s Cup Stakes, and the Pa Derby Champion Stakes. The gelding closed out the 2018 season with a score in the Claiming Crown Jewel Stakes at Gulfstream Park, earning $408,000 for the year. For good measure, he added a win in the Grade 3 Fred W. Hooper Stakes at Gulfstream Park January 26 to run his win streak to nine. Social media helped promote a big day of racing coming up at Laurel Park, when it was shared that the kickoff for the MATCH Series is drawing near. Five different racetracks will play host to the MATCH Series, starting off with Laurel Park on April 20. Horses in four different divisions will race for points and bonus money. Each race will have a purse of at least $100,000. The Laurel group will consist of the Frank Whitely Jr., the Primonetta, the King T. Leatherbury, and the Dahlia Stakes. It is sure to be a competitive day filled with action, topped by the $125,000 Federico Tesio Stakes and $125,000 Weber City Miss. The latter two are “win and you’re in” races for the Preakness and Black-Eyed Susan, respectively. After the MATCH Series are run at Laurel Park, the series will continue through Penn National Race Course on June 1, Delaware Park on July 13, Parx Racing on September 2, and finally, Monmouth Park on September 28. 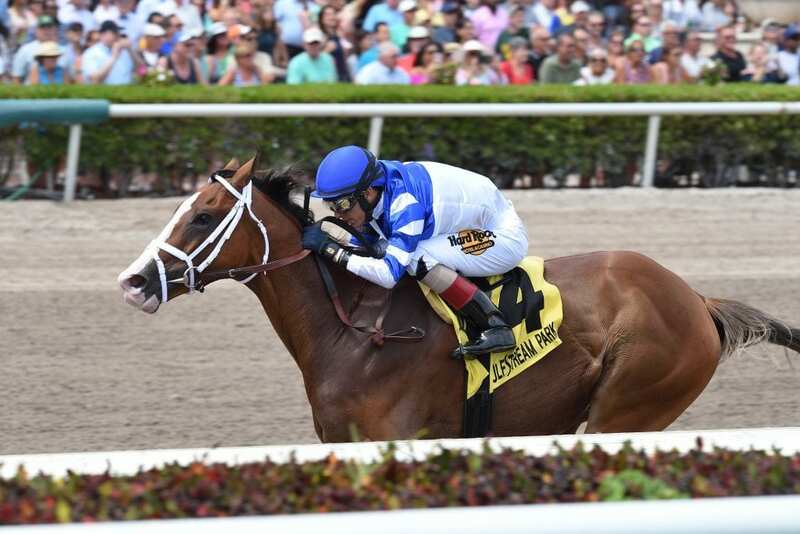 Pennsylvania-bred Prince Lucky once again found himself on the center stage of social media after his effortless score in the Gulfstream Park Mile (G2) over the weekend. The Todd Pletcher trainee dominated the $300,000 event, bringing home the money for owner-breeder Daniel McConnell and regular rider, John Velazquez. Prince Lucky, who was the odds-on favorite for the race, took command after tracking the pace for a half-mile, setting fractions of :47.04 and 1:11.31 through the six-furlong mark. When Velazquez asked Prince Lucky for more he responded with enthusiasm, drawing clear to win by 4 ¾ lengths. The gelded son of Corinthian stopped the clock in a final time of 1:35.21, collecting his third win in a row. A native of Carroll County, MD, Chelsea is an avid racing fan and a recent college graduate with an AA in Marketing. She has a racing blog called "Down to the Wire" and can be found on Twitter @Down2TheWire.